I've wanted a pair of gorgeous Kate Kanzier ballet pumps ever since I saw them in a magazine months ago. I bookmarked the page and contemplated which pair to buy. My laptop promptly broke (HP, two years old, they refused to mend or replace), I lost all of my bookmarks and I couldn't remember the name of the shop with the beautiful shoes. I finally spotted a pair in another magazine this week and we're back in business! 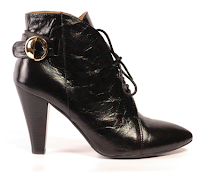 Kate Kanzier sells a delectable range of shoes and bags; from boots, to brogues, heels to clutch bags. 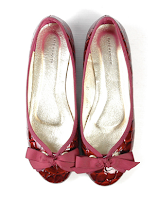 Many are made of leather and all are very reasonably priced (ballet pumps are £20-£25). There's a sale on at the website until 14th February. 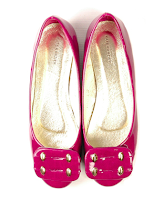 This means awesome bargains such as these pink patent buckle ballet flats (below) for £8, but also limited sizes and some out-of-stock bags. It's a transitional time of the year, so I expect once the sale is finished, more stock will be available. I'm so tempted to order some shoes in the sale, but I think I might force myself to wait until I'm in London next week and visit their shop on Leather Lane. I fear I might get overexcited and develop a 'trolley dash' technique of trying on and buying far too many pairs. 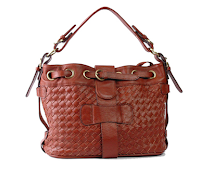 And then there's the bags! Oye! I think you may have just got me addicted to pumps again!!! I visited the shop today! I got two pairs of leather boots for £15 each! OH YEAH! It was a strange, (painted) black little place, more like a storage room than a shop. The staff served out of a cubbie hole in the back, like a tuck shop! Still, the sale was ace, and there were tonnes of bargains to be had. I literally tried on every shoe in my size (or near enough) in the entire shop. I have only recently heard of Kate Kanzier -I dont know how it slipped by me for this long.I'm off to buy some brogues there this afternoon- excited. Love you blog.